How many shadow figure can you do straight off the bat? Mostly, it's not even 2, but this app will help you! Step by step, this app will explain how to hold your hands to create the illusion of a unicorn, a parrot or a dog. Of course it's all fully illustrated. 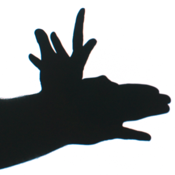 The instructions will not only show you the shadow image, but also the hands, so you can see how the fingers are held. This will make it very easy to reproduce the shadow figures.